Well in Jesus’ day, it was perfectly normal to practice both of the main kinds of Judaism. One was centered on the Temple in Jerusalem, and those who ran it were usually pretty distant from the average man or woman—especially the people out in the countryside. On the other hand, the religion of Jerusalem was often seen as more cooperative with Rome, which had to approve of it in order for it to avoid harassment. Just about all Jews practiced this religion whenever they went to the Temple to make the necessary sacrifices. The other kind of religious practice was the accessible kind—the kind that went to synagogue on the Sabbath and learned the meaning of the scriptures, and how to incorporate Jewish Law into everyday life. This kind of Judaism was associated with its teachers, who were the Pharisees. And Jesus was also seen by many—both then and now—as belonging to this movement. This is difficult to see because of the tension that we read about in the gospels. And because Jesus sometimes has harsh words for the Pharisees, we often make the wrong assumptions about other exchanges, such as the one we find in Luke’s account of what happened on Palm Sunday. Here we find all the disciples greeting Jesus’ triumphal entry into Jerusalem not with palms, but by laying their cloaks on the road to hail him. Their shouts are so loud that some Pharisees who were among them—and please note here that Luke’s words make it possible that the Pharisees were also disciples—told Jesus to quieten the crowd down. We might assume, based on what we have heard about Pharisees, that they’re being petty, or mean-spirited, or jealous. But I don’t think that’s it at all. They’re among the disciples, and they call him Teacher. I think what’s happening here is that they’re trying to protect Jesus. We seem them do it in other places. And I’m pretty sure they’re doing that here: Teacher, if the crowd keeps this up, it’s going to get you in trouble. They’re not jealous, but they’re aware of the jealousy of the priestly class who administer the Temple—the same ones who cooperate with King Herod, who’s really just a puppet of the occupying army. Even more likely, they’re also aware that the Roman authorities might catch wind of someone who might make claims that compete with the Emperor. Looking at it as history, we, of course, can see that the Pharisees were correct. The religious and the government authorities ended up joining forces to put an end to the threat that Jesus represented. In my limited understanding, I like to tie up the Holy Week story in a nice little package that fits my theology—or at least my view of the fickleness of human nature. I imagine that the same crowd that shouted Hosanna! on Palm Sunday also shouted Crucify him! on Good Friday. But this isn’t what the Bible says. Luke says specifically that it was Jesus’ disciples who hailed him on Sunday, but there’s no mention that it was his disciples who called for his death on Friday. Though the disciples might have been fearful, the Bible doesn’t say that they turned on him. The ones who welcomed him as King and Savior were probably not the same ones who condemned him. But even if they were, the truth had to be told openly. And the truth was that the One they welcomed really was the King and really was the Savior. The fact that he wasn’t the kind of King and Savior they thought he was going to be was no reason for them to keep silent. If they had, God would have brought forth that same proclamation from inanimate rocks. The Pharisees were worried about what might happen. Their opposites were the children. Luke doesn’t mention them, but Matthew does. It was the children’s voices that the scribes and the priests heard all the way from the Temple. And it’s the children that we’re most likely to remember on Palm Sunday. I think this may be because we’re often like the Pharisees. We worry about what people might think, or we worry that what we say today might seem foolish—or even come back to bite us—tomorrow. Palm Sunday is perhaps the best example we have of this in any kind of literature. But children don’t worry. Sometimes we might wish they did. But they say what’s on their minds and they don’t worry about what people might think and they’re blissfully unaware of the consequences. Children are able to live in the moment in ways that adults cannot. 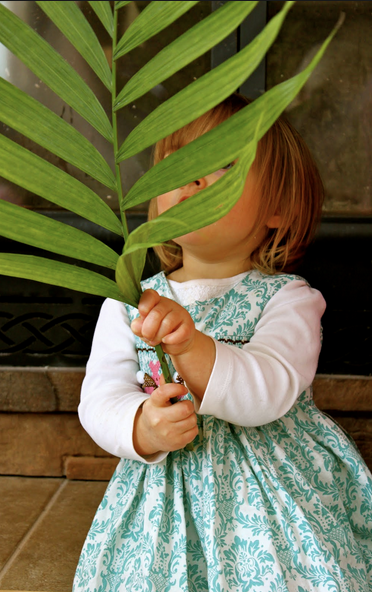 So it was the children who sincerely welcomed their King into Jerusalem on Palm Sunday, and it was the children who weren’t ashamed of it afterwards. I hope this helps us understand what Jesus meant when he said that, unless we change and become like little children, we’ll never actually enter into the Kingdom over which Jesus reigns. As we enter Holy Week, let us hang on to the acclamation of the crowd. When that other crowd turns on Jesus, let’s not be embarrassed that we were among those who called him King and Savior. Though we see him nailed to a cross, and our hope will die with him, the day will come soon enough that his salvation will be made known. He won’t be the kind of King we expected—not what we had in mind when first we invited him to reign over us. But the King that God has in mind is infinitely better than what we thought we wanted. The children know this already. Perhaps we’ll discover on Easter Sunday that they’re right.